A three-day weekend means firing up the grill and opening up the wine bottles. 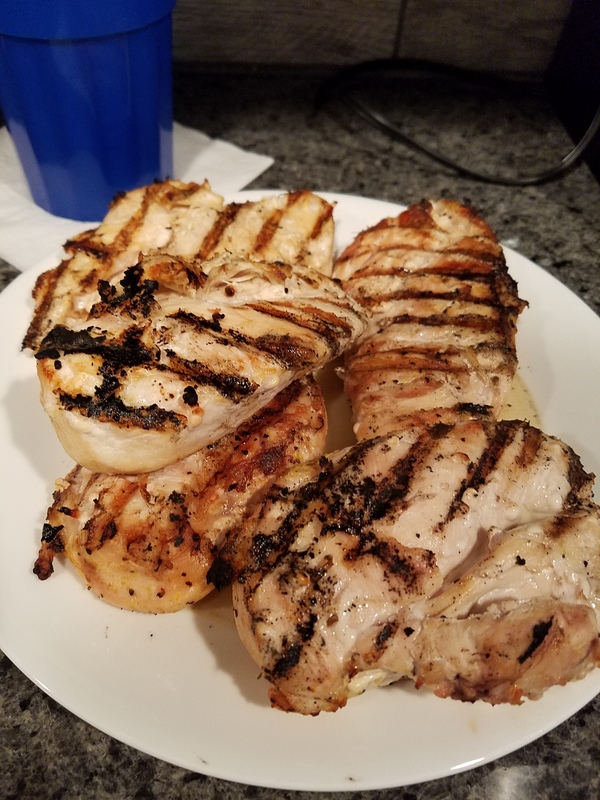 For one of the meals, I grilled thick cut pork chops that turned out to be super moist and very tasty. For the wine I decided on a Sauvignon Blanc. I opened a bottle of Airfield Estates, Sauvignon Blanc vintage 2014, from Yakima Valley Washington. The wine was almost clear in the glass with just a very faint hint of pale yellow color. I smelled lemons and minerals when I stuck my nose in the glass. The wine was very dry with a mineral taste and a light citrus taste. It was a light and crisp wine that had a dry finish. I would put this wine up against some of the California Sauvignon Blancs I’ve tasted. 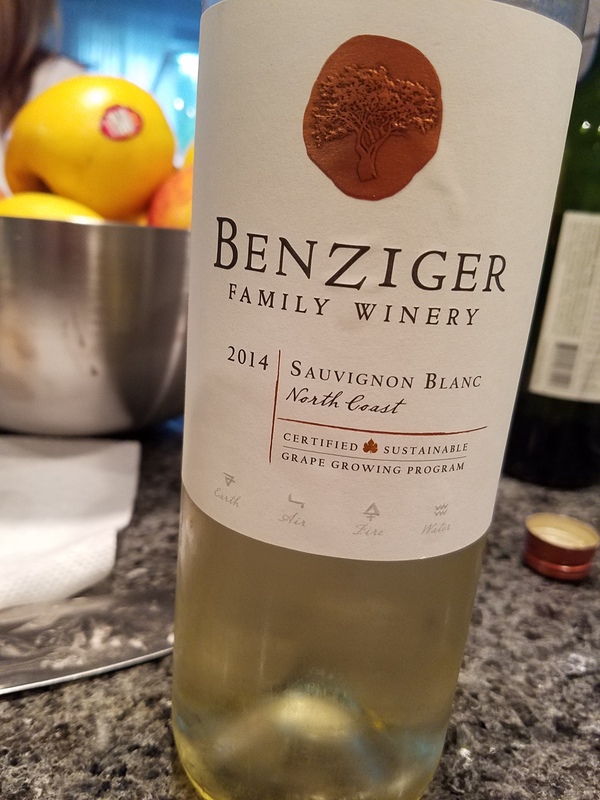 The wine was dry and crisp and clean tasting and went well with the pork chops. Cooler temperatures and rain have made a comeback here, at least for the next week or so. I’ve rescued a few of my pans and utensils from the storage unit and am able to cook again. Tonight it was a favorite of mine, chicken fajitas. For the wine I opened a bottle of Erath Pinot Blanc, 2013, an Oregon white wine. The Pinot Blancs that I’ve had in the past were soft and off-dry, fruit forward wines. This one was quite different than those. This wine was dry, crisp and had that mineral taste synonymous with a Sauvignon Blanc. The wine was a yellow golden color more like a Chardonnay than a Sauvignon Blanc. The wine tasted somewhere between a Sauvignon Blanc and a Chardonnay, with that hint of that flat beer taste I get whenever I drink an oaked Chardonnay. I think this wine would have gone better with a different dish. Maybe something not so spicy like grilled chicken or shrimp. It didn’t go that well with the spicy chicken. Oh well live and learn. There are many more wines out there to try. In keeping with my New Year’s resolution I have been drinking more wine and writing down my experiences. Last week on my semi-monthly wine stock up one of the bottles of wine I bought was a Sicilian white wine from MandraRossa, Fiano, 2009. It had 13.5% alcohol content. The Fiano grape is an Italian grape that produces very little juice and small yields. To go with the wine I fixed a salad and chicken breasts, sautéed in garlic olive oil and onions. The wine was a bright yellow color, almost the color of straw. It was dry, not as dry as a Sauvignon Blanc, acidic with a hint of a citrus taste, and had a full finish. To me there wasn’t much taste, in fact I thought it was kind of bland, but Mitch liked it more and drank most of the bottle by himself. It went well with the chicken, not overpowering the dish. But I could probably have had a Sauvignon Blanc or a Pinot Grigio and it would have gone with the chicken just as well and I would have been happier. Oh well, at least I can say I gave it a chance and I can move on to another bottle. In two weeks it will be Thanksgiving and the official kick off of the holiday season. I know that the stores have been running ads and specials since before Halloween, but to me Thanksgiving is the starting point. Running around in search of the perfect gift for family, friends and co-workers, promises to be a constant source of anxiety and stress. I don’t know about you, but I agonize over the perfect gift for each one of my family members and close friends. Mitch hates going shopping with me because he knows that I’m going to drag him all over the countryside looking for that perfect gift, I’ll even go to multiple stores looking and looking, then head back to the first or second store and buy the item I had first seen. Silly huh? Well this year I would like to say I have a plan and not go through the same shopping excursions as in the past, but I know that nothing will change, I will go through the same agonizing search. The difference this year will be that I plan on drinking more wine which will ease my anxiety some. I’ve been working on my list of wines that will get me through the holidays and some may end up as Christmas presents, hostess gifts and just because I wanted to gifts. The list is a mixture of red and white wines all under $25 a bottle and some are under $10 a bottle so as not to break the bank and still have very tasty drinkable wines. For the white wine drinker I have a few choices that I always buy just to have around. For the red wine drinker these are some of the wines that I keep on hand to go with whatever I decide to fix for dinner. This list is just a start, a teaser so to speak. I’ll make another list as it closer to Thanksgiving, this one with some of my favorite sparkling and dessert wines. Even though there are technically twenty-one days until the first day of summer, it feels like spring has abandoned us for the muggy days of summer. I just got back from walking the dogs and am soaked through. So I thought today would be a perfect day to drink some chilled soft white wine and chill out. We had a very nice French White Bordeaux 2012 from Chateau La Castillonne. It was a Sauvignon Blanc, very light and dry but soft and tasted like pears. It was a wine that we had tasted at a French wine tasting a couple of months ago and bought a few bottles. It was very affordable at <$13 a bottle. It went very well with the grilled pork chops and salad. Another nice white wine that we like to keep on hand is a California wine from Joel Gott. We have tasted quite a few different Joel Gott wines, red and white and so far we have not been disappointed in any of the bottles we’ve had. Their Sauvignon Blanc is almost clear in the glass. The wine is everything a Sauvignon Blanc is supposed to be; dry with a mineral taste, clean and crisp with a tart finish. I usually don’t pay more than $13 a bottle for it and sometimes catch it on sale for $11. It goes very well with grilled chicken or grilled pork. So if you’re looking for something light and clean you can’t go wrong with either one of these wines.